There is no denying that family and our role within a family unit plays a direct role in who we are. For better or worse the family structure is complicated, magical and mysterious. 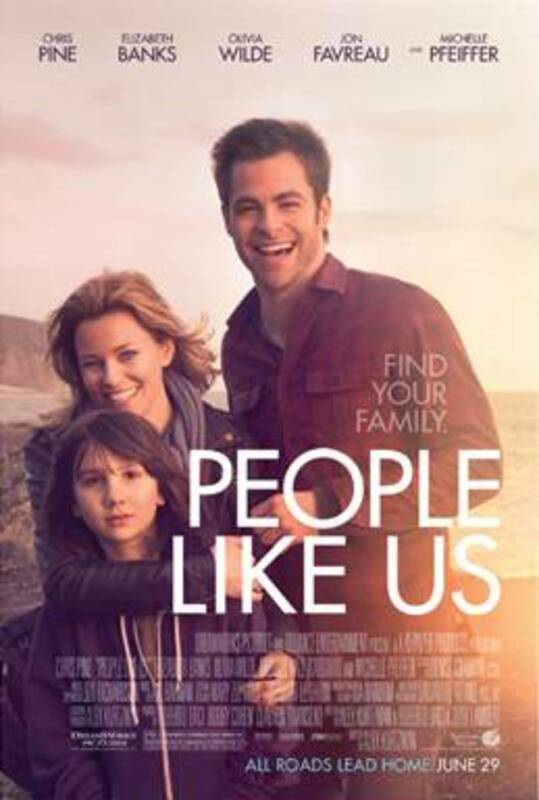 During my recent press trip to Los Angeles, I had the chance to see a unique depiction of a family on screen in the new film People Like Us. Co-written and directed by Alex Kurtzman (he also wrote &apos;? ?Star Trek,&apos;? &apos;? ?Transformers,&apos;? &apos;? ?Mission: Impossible III&apos;? and &apos;? ?Transformers: Revenge of the Fallen"), this drama/comedy follows some events that were inspired by true events in Kurtzman&apos;s life (more on that in an upcoming interview post with Kurtzman). This dynamic story follows Sam (played by Chris Pine) as a fast-talking salesman, whose latest deal collapses on the day he learns that his father has suddenly died. Unable to grasp with the situation, he returns home to find out that his father had another daughter, Frankie (played by Elizabeth Banks) and is tasked with the responsibility of fulfilling an inheritance to her. Completely shocked about learning that he has a sister and that his estranged father left her money, he is forced to understand more about his father as well as interact with Frankie and her son, Josh (played by Michael Hall D&apos;Addario) to try to piece together a life that he never knew he had. Throughout the course of movie, he gets closer to Frankie and her son as he takes on a quasi-father-figure role where he takes him to record stores and shows up when he gets in trouble at school. For the first time in his life he is present and excited to participate in this new family; however, the complexity (and uniqueness) to the film is that he doesn&apos;t tell them right away who he is. I also really enjoyed the dialogue between Sam and Frankie as their complex relationship unfolded as they start to feel very comfortable with one another after only knowing each other for a few days. There relationship eventually unfolds as Kurtzman then follows them on a path of rediscovery, and eventually as a true brother and sister. Another interesting element in the movie involved music. I loved how Kurtzman interweaved music and the many emotions that it evokes through the story, which touched upon Sam&apos;s experience growing up in the house and how he passed along his love of music to Josh. It almost seemed as if Sam and his dead father had a special bond where they were unable to share when he was alive. Poignant and very emotional, Kurtzman picked an amazing soundtrack for the film that was also depicted beautifully in the backdrop of Los Angeles. Throughout the course of the movie, we also get to see his interesting relationship with his mother (played by Michelle Pfeiffer) who is also disconnected and figuring out her own life as widow and what it means to have been living all of these years knowing that her husband had a second family that he never saw. Not a particularly likable character, I did admire how the movie subtly built their relationship as they both tried to understand one another or as Sam said best, "be people." A movie about the contemporary modern family, People Like Us is a rare gem that is rich with strong dialogue, amazing actors and an incredible story that truly makes you think about the dynamics of family, and how its structure shapes you were in the past as well as who you are today.